Historically, the wine is synonymous with partying. In Châteauneuf-du-Pape, winemakers perpetuate vinous celebrations; often punctuate highlights in the work of the vineyards. Each year, a large crowd is attending the spectacular events. In the 19th century and until the Second World War, the winegrowers’ festival, which was also a religious and folk celebration, took place on Saint Marc’s Day, the 25th of April. At daybreak, a procession carrying a statue of the saint made its way through the vineyards to the commune’s three chapels dedicated to Saint Marc. At midday, most villagers gathered at Lhers Tower for a meal. This was also an opportunity for each winegrower to share his best bottles of wine. In the afternoon, men, women, and children played, danced, and sang until nightfall. In 1966, under the aegis of the town council, the Saint Marc’s Day celebration was re-established, along with a wine competition. Before sharing their best wines with friends and fellow winegrowers at the foot of Lhers Tower, as in the past, vignerons now take samples of their wines to the Fédération des Producteurs’ headquarters so that a panel of judges can select, after numerous tastings, the best wines in terms of appearance, bouquet, and taste. The prize-winners are announced at a grand event bringing together hundreds of people: winegrowers, négociants, elected officials, personalities, and lovers of Châteauneuf-du-Pape. Every year, three prizes are awarded: the best red wine from the most recent vintage, the best aged red wine, and the best white wine. It is a great honor to win a prize or to be designated a runner-up. Veraison is when the grapes begin to change color, thereby revealing their degree of ripeness. It is also the name given to the large celebration organized the first weekend of August since 1985 in Châteauneuf-du-Pape. Over two days, thousands of tourists have the opportunity to buy crafts, attend various performances and, above all, enjoy the best wines in the appellation. A large medieval parade and pageant reminiscent ties between the city to the papacy in the fourteenth century. Since time immemorial, the village elders set the dates of the harvest banns in Châteauneuf-du-Pape. After “a tour of the vineyards”, the town council tasted grapes from various parts of the terroir at a special meal and decided when the harvest should begin. Contrary to what one might think, the banns were not instituted in the interest of quality, but rather for fiscal reasons and to prevent the theft of grapes. “According to tradition, people employed to collect tithes were allowed to harvest three days before everybody else”. In this way, they were free to oversee and collect the archbishop’s tithe when the rest of the vignerons began picking. In 1962, the winegrowers association officially decided to re-establish the harvest banns and the supper, which preceded it. The reinstituted banns aim once more to preserve Châteauneuf-du-Pape’s quality, as well as to bring together the winegrowers at an informal, relaxed meal to celebrate the start of the harvest – the most important time of year. During the month of September, the winegrowers and their guests gather together for un grand souper ordinaire or “great supper”. The Federation of producers of Châteauneuf-du-Pape. Re-established in 1963, the Fédération des Syndicats de Producteurs de Châteauneuf-du-Pape promotes the same values that motivated the creation of the original Syndicat in 1923. The first president of the new Fédération, Pierre Lançon, of Domaine de la Solitude, was succeeded by several other winegrowers, including Bruno le Roy (Baron Pierre le Roy’s grandson), who has been president since 1994. The Fédération’s aims are to protect the Châteauneuf-du-Pape appellation by all legal means, to defend winegrowers’ interests, to help produce the best possible wine, and to promote the appellation. The Maison des Vignerons houses the Fédération’s administrative and sales departments, as well as a well-equipped enology laboratory and tasting room. Furthermore, the Fédération operates a boutique (Vinadea) in the town center, selling wine from some 100 different estates at a fair fixed price. Only members of the Fédération have the right to sell their wines in special bottles embossed with the papal coat of arms: a tiara above two crossed keys. This trademark guarantees the wine’s authenticity and quality. In addition to very strict production criteria, the wines of Fédération members have been subject to a compulsory taste test since 1979. Any wine not up to standard is refused the right to the appellation. 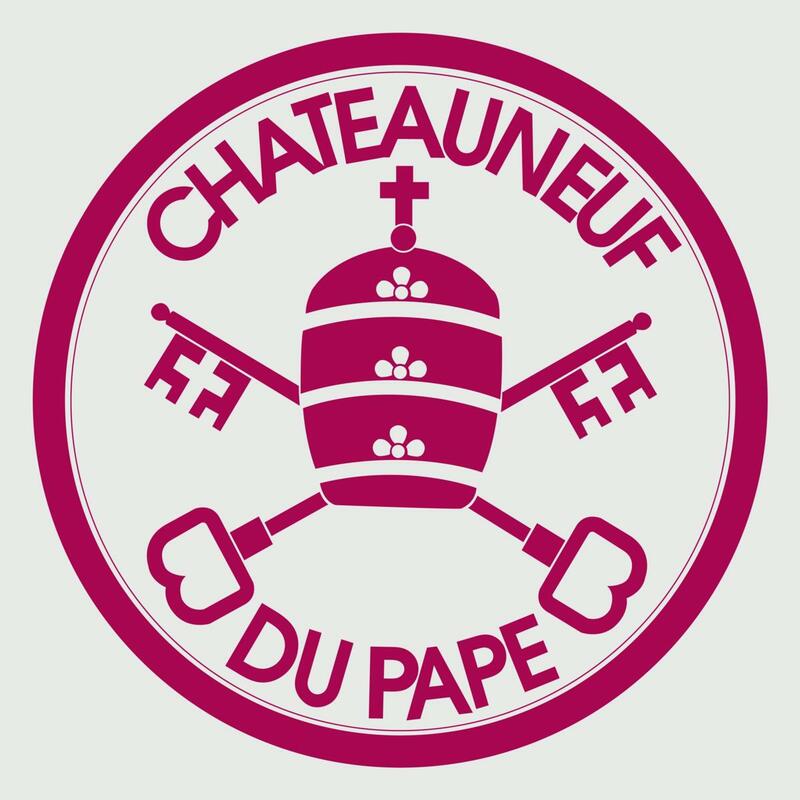 The village’s own wine brotherhood, the Echansonnerie des Papes (échanson = cupbearer) was founded in 1967 on the initiative of Doctor Philippe Dufays. Its aim is “to increase appreciation and understanding of Châteauneuf-du-Pape’s unique wines, and enhance the reputation of one of France’s greatest appellations”. The brotherhood also “keeps the past alive, especially with regard to the popes’ presence during the Middle Ages”. 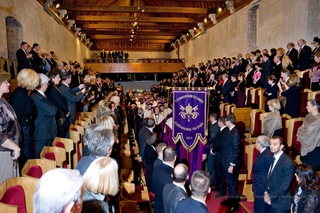 Among the brotherhood’s members include the founders, the Grands Echansons Dignitaires (of which there were 55), the Grands Camériers, and the Echansons and Grands Echansons “a camera paramenti” (titles given during induction ceremonies). laughing, and dancing to the sound of flutes and bagpipes”. As a symbol of friendship, each newly inducted member receives a key from brotherhood members “which opens the door to our cellars and the way to our heart”. Of course, Châteauneuf-du-Pape wine is the king – or rather the pope – of the celebration, and everyone pays homage to it. New échansons are able prove their talent at a blind tasting and the grand candlelit supper that follows is an occasion to enjoy many different wines (but not to excess! 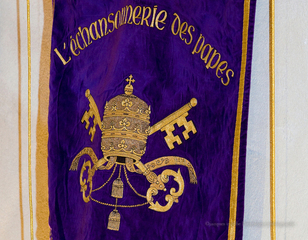 ).The Echansonnerie des Papes receives members from around the world. These include VIPs and people from all walks of life who contribute to promoting Châteauneuf-du-Pape wines via the Echansonnerie, for which they are the best possible ambassadors.